Southern Flames is sponsoring 4 days of classes with Brad Pearson May 12 – 15, 2005. There will be two one day classes and each will be offered twice. The first focusing on Shaping and the second on Large Mandrel beads. The Shaping class will be offered on Thursday (May 12) and Saturday (May 14). The Large Mandrel class will be offered on Friday (May 13) and Sunday (May 15). These intermediate/advanced classes will cover complex pattern creation, shaping graceful beads, and good design. Form, color and function will be discussed and students will be encouraged to improve upon there own existing style, by refining both their sense of shape and color. Both classes will be partially driven by the students’ special requests and interests. We will talk about what makes a good bead, and move on to creating donut shapes, round beads, long beads—getting perfect ends every time—and long bead variations. We will discuss problems and hints and cover theory of glass and shaping with surface tension and gravity. Each lesson builds upon and enforces the previous demo. Where there are different methods to build a particular shape, we will touch upon reasons to choose one technique over another one. We will achieve complex pattern decorations on these beads by using the overlay technique. This class continues to build on the basics that were presented in the shaping class, but it may be taken on its own. We will focus on making beads on large mandrels from ¼” to ½” in diameter, and will cover disk beads with twisted cane (pinwheel series), decorating with raking (pulsars or star beads), and using only texture as the design element (medallion series). l.
Since these are two separate classes, there will be two lotteries. We will hold the lottery for the most popular of the two classes first, determined by larger number of lottery entries. The following rules apply to each lottery. Class registration begins with this e-mail announcement for students to send in their applications and checks (see attached forms ). Each interested member must complete a Brad Pearson – Shaping Lottery Form and / or a Brad Pearson – Large Mandrel Lottery Form and provide a check with each for $125.00 made out to Southern Flames. You may complete and bring the attached form(s) and your check(s) to the March 9 meeting (additional forms will be available at the meeting). If you would like to be included in one or both of the lotteries but will not be able to attend the March 9 member meeting, you may mail a check payable to Southern Flames in the amount of $125.00 along with a completed copy of the Lottery Form for the class to Southern Flames, , 311 Peachtree Hills Avenue, Box 11A, Atlanta, GA 30305. If you would like to be in the lottery for both classes, then you need to send both forms and two checks for $125 each. Your check must be received by Monday, March 7, 2005. You will get a confirmation that your check and form has been received and you will be put into the lottery drawing. If you do not receive a confirmation, we did not receive your check and form and you will not be in the lottery. There will be eight spots available in each class session. Once all sixteen spots are filled for that class, names will continue to be drawn for waiting list positions. Please note on the form if you want to be placed on wait list status. Checks for wait list participants will not be deposited unless a class position opens for that person. In the past, we have had students withdraw due to various emergencies and have actually placed the last person on the waiting list in the class. Checks from lottery participants will be returned if the member is not selected in the lottery, unless the member indicates he or she would like to be on the waiting list. In that event, checks will be held but not deposited unless a class position becomes available. If at any time a wait list participant would like to be removed from the waiting list, he or she may notify Kim, and she will return that person's check and remove them from the waiting list. The check for the class is non-refundable. If your name is drawn and you cannot attend the class, your spot will be offered to the next person on the waiting list. You will be refunded your money if someone can take your spot. This must go through the Treasurer and the waiting list. You may not directly sell or give your spot to another individual unless all wait-listed persons have declined to fill the spot. The Brad Pearson Lottery Forms include your name, address, phone number, email address, preference of class session, and whether you wish to be placed on the waiting list if your name is not initially drawn for a spot in the class. If you can attend either class, you may indicate a preference, but could be put in your second choice class to allow Southern Flames members with less flexible schedules to still attend a class. As an example: I say I can attend either session but prefer Saturday. I'm selected and there is space in Saturday, so I'm put in Saturday. Later, in the lottery when spaces are only left in Thursday, someone is selected that can only come Saturday, so I would be moved to Thursday so that person could attend, too. Once the lottery is complete, if the classes are not full, an email will be sent to Southern Flames members giving them one additional week to register for the open spots on a first come, first placed basis via checks to Kim Runge either in person or at the address above. 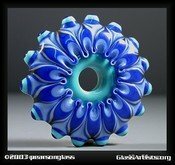 If the classes are not full after the additional week of open registration for members, registration will be opened to the general glass community via web forums, emails, etc. If you have any questions about Brad Pearson's classes or about the lotteries for them, contact Southern Flames Vice President, Kristy Nijenkamp, at Nijenkamp@bellsouth.net.